The other day I reviewed some items from Aurora Gifts. At the end of the review, I hinted to stay tuned because something else would be coming from Aurora. Yes, Aurora is offering my readers a giveaway. Thanks to Aurora, one lucky winner will receive an item from one of the lines that I reviewed. MAIN RULE – Go to the Aurora Gifts website and let me know which item you are most intrigued with and who it would be perfect for this holiday season. 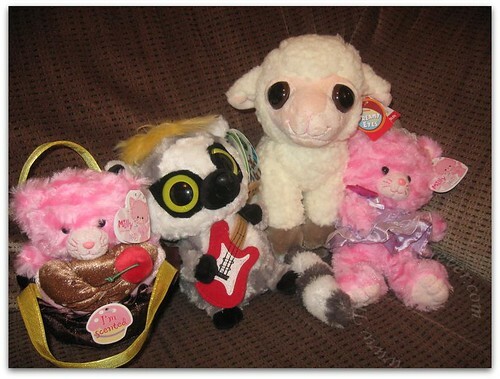 1 Bonus Entry – What animal would you love to see represented by the YooHoo & Friends line? 1 Bonus Entry – Leave a comment on any of my non-giveaway posts from the month of November/December. Leave a comment here to let me know which one. This Bonus entry may be done three times per person. To enter, please follow the rules above within the comment section. Contest starts today November 21 and ends at 10:59 EST on December 5, 2010. You do not have to be a blogger to enter, but must leave a valid e-mail address for me to contact you for mailing address once the giveaway is over. I will select the winner using random.org and contact you via e-mail. You will have 48 hours to claim the prize. If there is no response, another winner will be selected. Open to U.S. and Canadian residents only. Disclosure: This review and giveaway were made possible by Aurora Gifts and their PR company. They provided me with the items shown above to facilitate this review. The opinions of this review are mine and I received no other compensation. What animal would i like to see? The Mosquito! HA!! I would love to see them make a skeeter cuter! OOPS,I have ADD and missed the mandatory step.Hope this counts!I like the cute dreamy eyes pig! tweeted and realized I for got to say who I would give this to if I won.I am really off today! I think my BFF’s daughter would LOVE the 8″ Silver & Bows Pet Carrier. I think my favorite animal would have to be either Millie or Cheeky Charlie. Although they are all so cute. I am a sucker for stuffed animals. I like the fancy that line too. Looks right up Kait’s alley. I just posted a blog too. just another link to my blog post that links to yours. I like the 8″ MILLY WITH HAPPY BIRTHDAY BALLOON and it would be perfect for my granddaughter who just turned 1 years old. I would love to see a Polar Bear or panda. Quanda´s last blog post ..Mom Rocks the Holidays with Rayovac! Oh the little lamb gets my gander up. Left a comment on the Prindable apples post! Wow do thsoe look great! Gotta have the monkey for DD… she loves monkeys. Thanks to everyone that entered the giveaway. The winner has been selected and will be notified by e-mail shortly. This informaiton will also be posted on the giveaway page located at the top of my web site.